Today we witnessed Jenny Jones make Olympic history by securing Great Britain’s first ever medal on snow, and the first of the Sochi Games. The 33-year-old from Bristol put down a solid second run in the snowboard slopestyle to achieve third place behind Jamie Anderson of the USA and Enni Rukajarvi of Finland. With a score of 87.25, Jones sealed the third spot by just 0.25 points over Switzerland’s Sina Candrian in a final that was full of twists, turns and surprises. And the brilliant commentary from Ed Leigh, Tim Warwood and Aimee Fuller in the BBC commentary box left many of us around the UK in fits of excitement and floods of tears as Jones made Olympic and British history. She told BBC Sport afterwards, “I did the best run I could have done,”. Aimee Fuller unfortunately didn’t make the final after coming 9th in the semi-finals earlier in the day, but she was definitely a crowd-favourite after her front-flip off the last lip. However at only 22-years-old, Fuller is still young and so we’ll surely be seeing much more of her over the next fews years and the next Winter Olympics in South Korea. 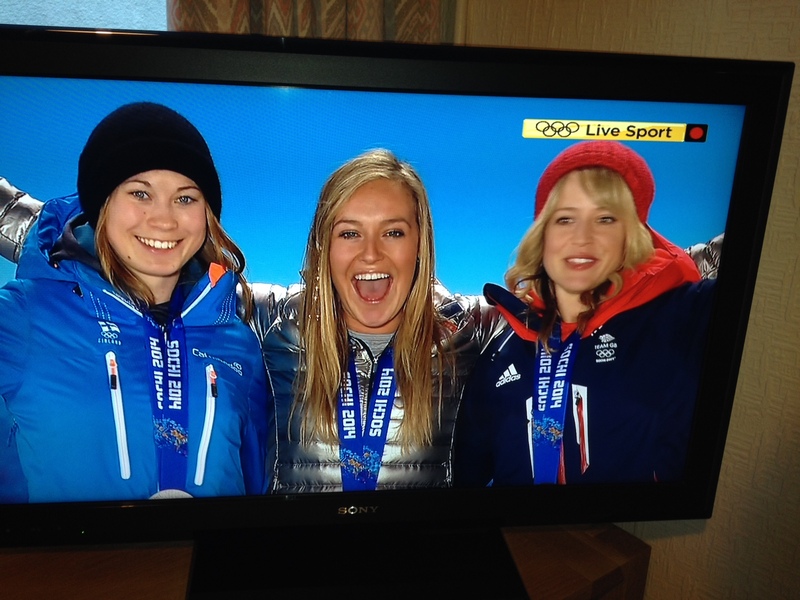 Great Britain tune in to BBC2 now to watch @jennyjonessnow receive her historical medal in 10 mins. Enjoy it Jenny – we are all so proud! Jones technically becomes the first Britain to win an Olympic medal on snow after Alain Baxter had his bronze in the Men’s Slalom taken away from him at the 2002 Games in Salt Lake City due to the use of a Vicks’ inhaler that was on the list of banned substances. Much controversy still surrounds this event, and one must still question how the ‘substance’ could have influenced his performance in any way. The event still strikes a nerve with many of us! But this is not to take away from any of Jenny Jones’ fantastic success. She has been a role model in British snowboarding for some time now, and has hopefully inspired a brand new generation of youngsters to pick up a snowboard and give it a go. Congratulations Jenny! Tune into BBC Two again tomorrow to catch the Women’s Super Combined event from the Rosa Khutor alpine resort.